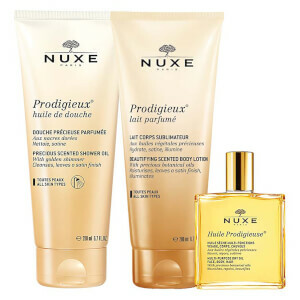 The NUXE Eastern Pouch Gift Set combines everything you need for soft, hydrated and delicately scented skin. Housed in a zipped travel bag. A luxurious, delicately fragranced oil infused with the brand's signature scent of Orange Blossom, Magnolia and Vanilla. A dose of Sweet Almond Oil gently cleanses and nourishes, whilst delivering a soft, satin finish. Hydrate thirsty skin with the intensive moisturising and softening cream for normal skin types. Infused with plant milks and White Blossom to maintain an optimum level of water and leave skin comfortable all day long. A multi-usage dry oil for the hair, face and body specially developed using six precious plant oils. Suitable for use as a nourishing hair and scalp treatment, or a bath or massage oil to soften and hydrate from head to toe. 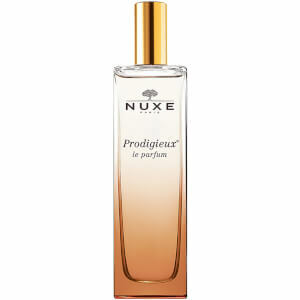 A floriental fragrance expertly blended with notes of Orange Blossom, Magnolia, Rose and Vanilla. Housed in a luxurious bottle, the enigmatic perfume is both heady and warm, perfect for both day and night. Enriched with Sweet Almond and Coconut Oils, the fast-absorbing lotion delivers a silky veil of softness and hydration to leave skin feeling smooth, supple and comfortable. The signature fragrance uplifts the body and senses. Shower Oil: Apply in the morning and/or evening to damp skin and then rinse. Crème Fraiche: Apply morning and/or evening to the face and neck. 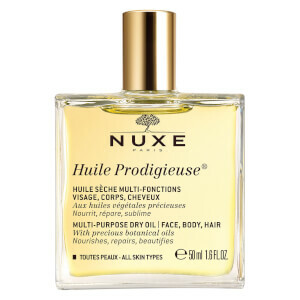 Huile Prodigieuse®: Use on the face, body or hair to smooth and condition. Perfume: Spray onto pulse points. Body Lotion: Apply in the morning and/or evening to the whole body. Shower Oil: Aqua/Water, Sodium Lauroyl Sarcosinate, Coco-Glucoside, Glycerin, Cocamidopropyl Betaine, Parfum/Fragrance, Glyceryl Oleate, Acrylates/C10-30 Alkyl Acrylate Crosspolymer, Peg-7 Glyceryl Cocoate, Benzyl Alcohol, Phenoxyethanol, Glyceryl Laurate, Sodium Chloride, Sodium Gluconate, Sodium Hydroxide, Citric Acid, Mica, Prunus Amygdalus Dulcis (Sweet Almond) Oil, Ci 77891/Titanium Dioxide, Dehydroacetic Acid, Sodium Benzoate, Ci 77491/Iron Oxides, Hydrogenated Palm Glycerides Citrate, Tocopherol, Benzyl Salicylate, Linalool, Limonene, Citronellol, Geraniol [N2210/A]. Crème Fraiche: Aqua/Water, Glycerin, Caprylic/Capric Triglyceride, Dicaprylyl Ether, Butyrospermum Parkii (Shea) Butter, Cetearyl Alcohol, Macadamia Integrifolia Seed Oil, Parfum/Fragrance, Xylitylglucoside, Glyceryl Stearate Citrate, Behenyl Alcohol, Dimethicone, Lauryl Laurate, Silica, Anhydroxylitol, Tocopherol, Polyglyceryl-3 Stearate, Phenoxyethanol, Xylitol, Ethylhexylglycerin, Hydrogenated Lecithin, Sodium Acrylates Copolymer, Sodium Stearoyl Glutamate, Dehydroacetic Acid, Allantoin, Sodium Gluconate, Lecithin, Helianthus Annuus (Sunflower) Seed Oil, Citric Acid, Sodium Carrageenan, Sclerotium Gum, Glycine Soja (Soybean) Oil, Camellia Oleifera Seed Oil, Capryloyl Glycine, Citrus Aurantium Dulcis (Orange) Flower Extract, Prunus Amygdalus Dulcis (Sweet Almond) Flower Extract, Cocos Nucifera (Coconut) Oil, Prunus Amygdalus Dulcis (Sweet Almond) Oil, Glycine Soja (Soybean) Seed Extract, Pisum Sativum (Pea) Extract, Disodium Edta, Avena Sativa (Oat) Kernel Extract, Maris Sal/Sea Salt, Camellia Sinensis Leaf Extract, Prunus Amygdalus Dulcis (Sweet Almond) Fruit Extract, Robinia Pseudoacacia Flower Extract, Cocos Nucifera (Coconut) Fruit Extract, Linalool, Geraniol, Limonene [N3601/B]. 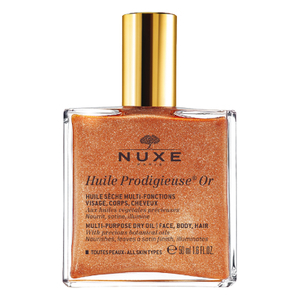 Huile Prodigieuse®: Coco-Caprylate/Caprate, Macadamia Integrifolia Seed Oil, Dicaprylyl Ether, Caprylic/Capric Triglyceride, Prunus Amygdalus Dulcis (Sweet Almond) Oil, Corylus Avellana (Hazel) Seed Oil, Camellia Oleifera Seed Oil, Parfum/Fragrance, Camellia Japonica Seed Oil, Tocopherol, Argania Spinosa Kernel Oil, Borago Officinalis Seed Oil, Tocopheryl Acetate, Helianthus Annuus (Sunflower) Seed Oil, Rosmarinus Officinalis (Rosemary) Leaf Extract, Polyglyceryl-3 Diisostearate, Ascorbic Acid, Solanum Lycopersicum (Tomato) Fruit Extract, Benzyl Salicylate, Linalool, Limonene, Citronellol, Geraniol, Benzyl Alcohol [N2212/A]. Perfume: Alcohol Denat., Parfum/Fragrance, Aqua/Water, Benzyl Salicylate, Linalool, Limonene, Citronellol, Geraniol, Benzyl Alcohol, Benzyl Benzoate, Citral [N2205/A]. Body Lotion: Aqua/Water, Glycerin, Coco-Caprylate/Caprate, Dimethicone, Hydrogenated Coconut Oil, Macadamia Integrifolia Seed Oil, Behenyl Alcohol, Parfum/Fragrance, Hydroxyethyl Urea, Arachidyl Alcohol, Cocos Nucifera (Coconut) Oil, Copernicia Cerifera Cera/Copernicia Cerifera (Carnauba) Wax, Hydroxystearic/Linolenic/Oleic Polyglycerides, Silica, Hydroxyethyl Acrylate/Sodium Acryloyldimethyl Taurate Copolymer, Tocopherol, Capryloyl Glycine, Prunus Amygdalus Dulcis (Sweet Almond) Oil, Corylus Avellana (Hazel) Seed Oil, Arachidyl Glucoside, Citric Acid, Ethylhexylglycerin, Sodium Hydroxide, Carbomer, Dimethiconol, Camellia Oleifera Seed Oil, Dehydroacetic Acid, Sodium Gluconate, Sodium Stearoyl Glutamate, Mica, Ci 77891/Titanium Dioxide, Ammonium Lactate, Polysorbate 60, Sorbitan Isostearate, Argania Spinosa Kernel Oil, Borago Officinalis Seed Oil, Biosaccharide Gum-1, Sodium Levulinate, Glyceryl Caprylate, Sodium Anisate, Benzyl Salicylate, Linalool, Limonene, Citronellol, Geraniol [N2211/A]. These products have exceeded my expectations by far. I love the smells of each of these products. Very inviting scents. I recommend this to anyone looking for hydration and moisturizing products! This is exactly what you're looking for, no need to look further. Lots of compliments on my skin this past week too. Love them all!! !